Attention: This is an export Price List, valid for companies in the European Community with a VAT Identification number, and for companies or private persons outside the European Community. please ask for a quote, including 19% VAT tax. These are boxes of 50pcs. Perfect quality sockets. Ceramic disc, gold plated. This is surplus form one of our customers, who stopped with his company, but these sockets are the same as current new production. This is clean and 100% good material. Appr. 700 pcs on stock. Shiny like new. price: 35 Euro for the box of 50pcs. Perhaps worth it the gold plating alone! On Ebay you can see some Chinese, doing direct sales, and want 13 Euro for 10pcs, or 7 Euro for 4pcs, and these are NONE-GOLD plated. These we sell here, are gold plated, cost only less than a Euro, but you need to buy a full box of 50pcs. Smaller quantity, at normal prices, from the price list. I am fully selling off my AVVT stock. Some I kept ever since 1999 as collector items or just for the memories, but I prefer to have more space here, and now clear all AVVT items. Some are listed without pictures, I had no so much time. If you want pictures of some, please just let me know. 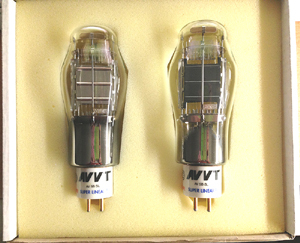 AVVT NOS tubes are extremely rare now. So you may think, why... so many here.. but these are really the very last! IT WILL NOT COME AGAIN LIKS THIS. Rare Blue glass version. 8B is a small PX25, but with 5V Heater. 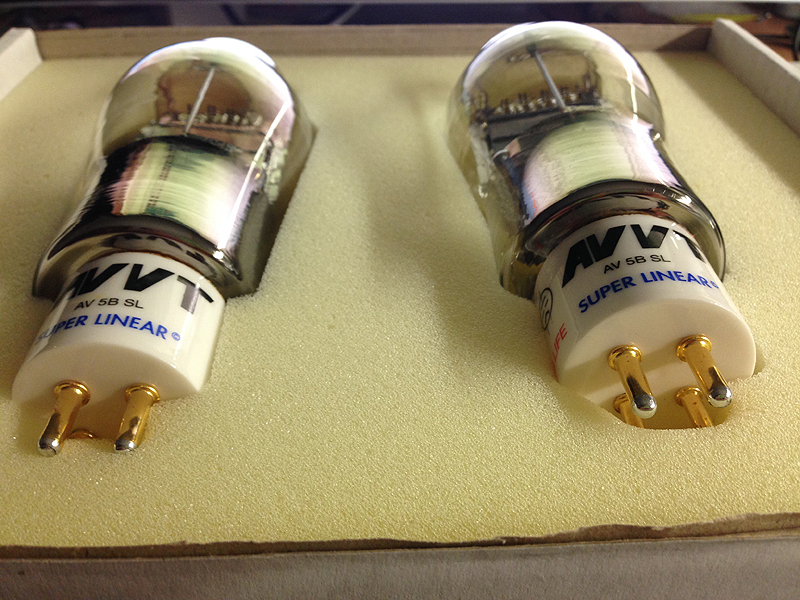 Beautiful, exclusive tubes. Less than 10 pairs were made ever with blue glass. If your want something rare and special, this is really it. You can probably even replace a 45 with those tubes, but you need to make sure you have 5 Volt for the heater. I see very good chances this will work, but you may need to adjust the bias to 11 Watt, though I expect this will be so by itself. No guarantee on this of course. Keep it is mind as a possible option. I have tried to display the colors correct. So no tricks with photoshop. Though I have to say they look in real life much nicer as on the pictures. They look magnificent. Like objectst of art, and I think that is what they are indeed. 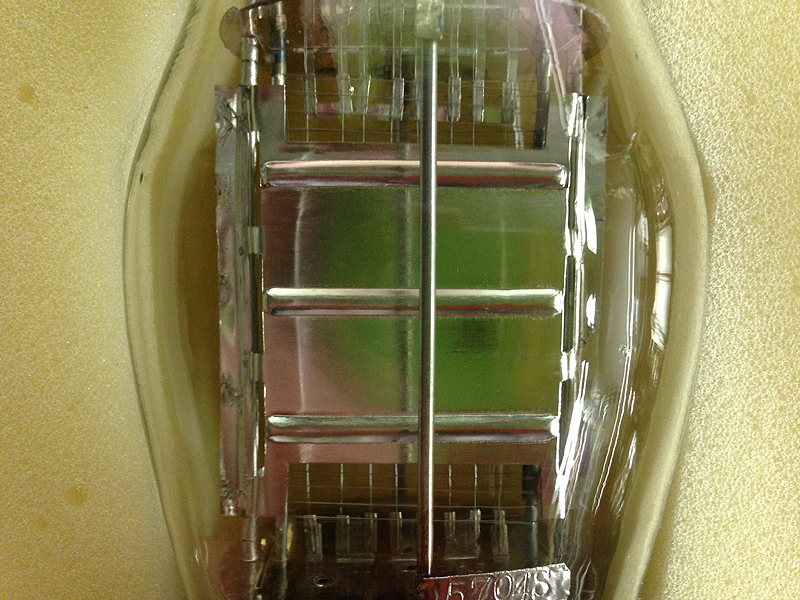 The anodes at the inside are white mirrored. The official datasheet here for the AV8. New, unsued tubes. Top Quality NOS from the best period. 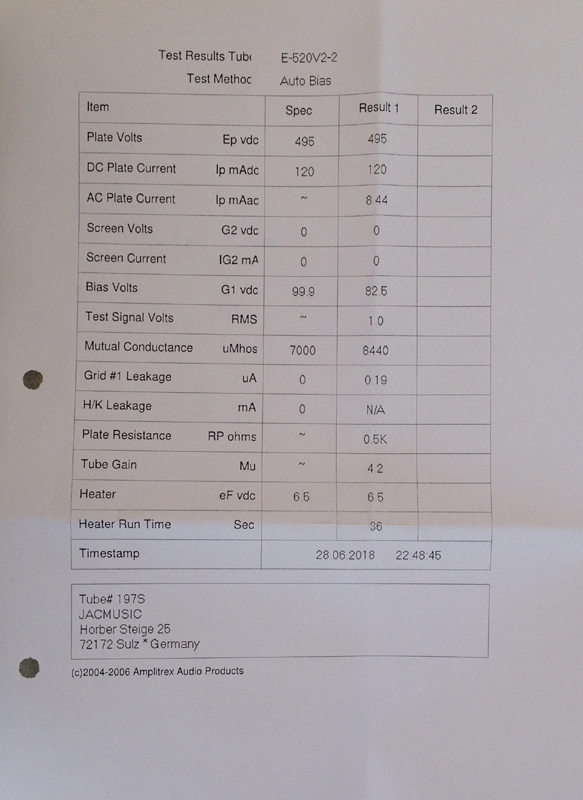 I have to print test reports, these will be added with the tubes. 5B is a low power version of 300B. 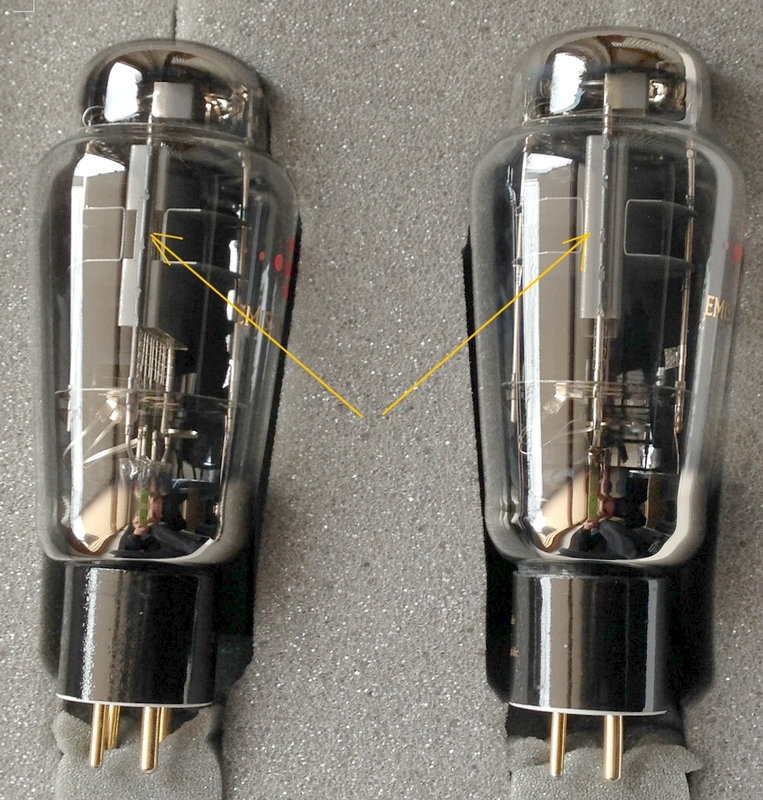 If you have a pre amp, head phone, or driver application, running the tube at lowe power, you can replace such 300B by 5B. NOTE: One tube is with white anode, the other with gray anode. For the rest they are optical identical, and electrically a well mathed pair. See data below here. The official datasheet here for the AVB. These are tubes from normal production, several pieces and one pair. AD100 is a stonger version of the 300B, with the difference being the heater is 4 Volt, 2.2 Ampere. So really a very large heater. 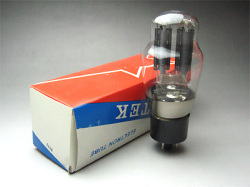 This tube was develope to show the superior sound of 4Volt tubes, which have always been the favorite of Mr. Vaic. Click the link to the datasheet, for more information. 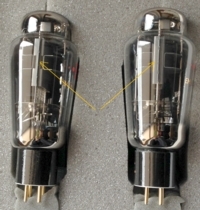 These are GREAT tubes for a DIY project, you can just use any 300B circuit, as long as you use a 4 Volts DC heater. Note, lifetime of this tube is very good, because of over dimensioned heater. Mr. Vaic itself produces a series of AD100 amplifiers with it, which you may find in the internet probably. He baised the tubes very hard in those amplfiers, above 50 Watt plate dissipation, but frankly I do not recommend to do so. Just do things normal as you would do with 300B, and lifetime of those will be perfect. When you stay with the 300B bias point and design, you could replace them by 300B, as long as you have a way to switch the heater from 4V, 2.2 Amps to 5V for the 300B. Personally I would recommend you so, and you can build a great amplifier that way. AD100 probably has greater dynamics as 300B, because of 50% larger heater power. Moreover the glow appearance of AD100 is very nice. This is a good working prototype of the AVVT 2A3 solid plate. Sorry, just one tube. New, unsued tube. This is a lovely build, and very good working AVVT PX4 tube, with the only exception it has a 5V heater. Tube curves and test report ist with it. New, unsued tube. 8B is THE driver tube from AVVT. Appearance like AVVT 300B, but white plate. Here comes the nice thing: This is a small version of PX25, but 5V filaments and 11 Watt max, and UX4 Socket. So it hast the higher gain factor same as PX25, and the gentle sound of PX25, only half of the size. New, unsued tubes. One NOS tube left. This a NOS from their normal production. The lost NOS I had, I kept as a demo. 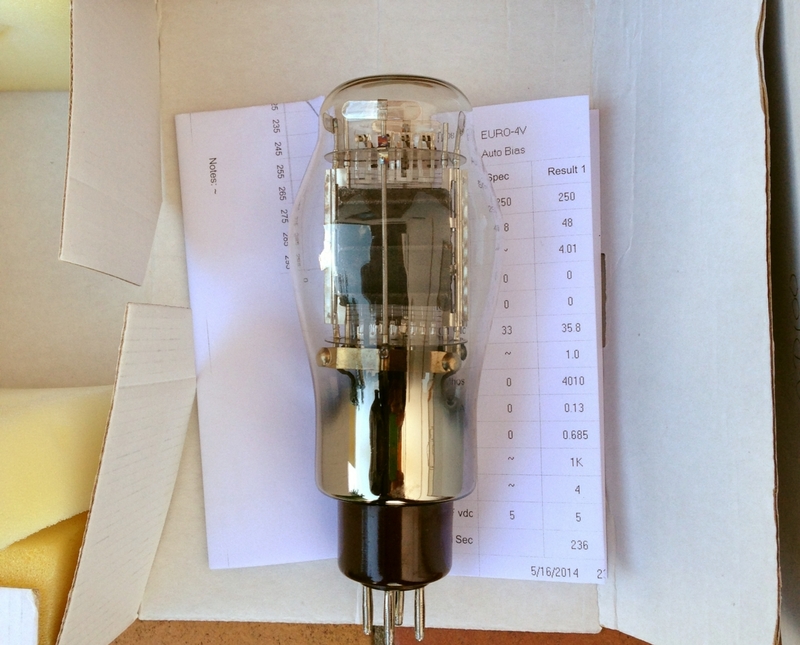 New, unsued tubes. We do this at EML factory. We are probably the only company able to do this. We have the possibility to overhaul any defective AVVT solid plate tubes, but prices of this is higher than buying new Emission Labs tubes. Reason is, when building new tubes, we can take unused, cleaned parts from stock. When overhaul an AVVT tube, we have to take the old tube fully apart which is time consuming. Then, the old parts must be re-shaped and repaired, then cleaned with by sand blasting, then chemical cleaning, and then vacuum heating. So this is all a lot of work, but the result is the AVVT tube with most of it's original parts, and in far better quality as ever made by AVVT. 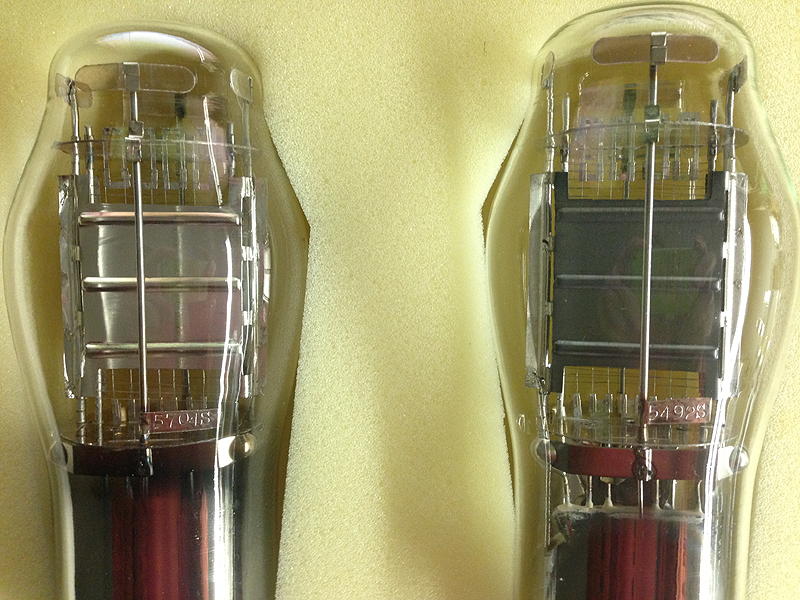 Heaters: we use the darker glowing Emission Labs heaters, which have a multiple life time as the AVVT heaters. 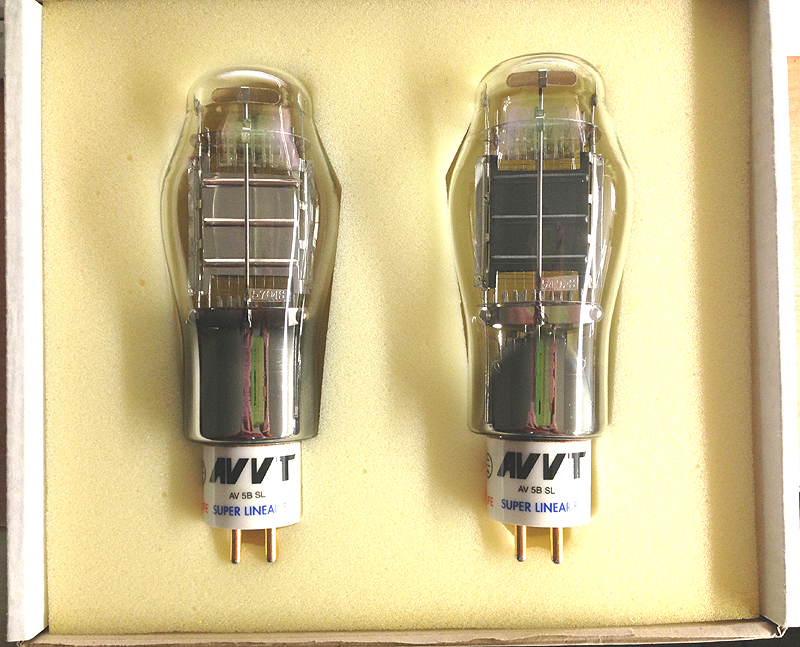 Tube data: The AVVT grids can not not be re-used. We use new grids, belonging to the EML heaters. Result of this is, the tubes come out with somewhat lower Transconductance (Gm) as AVVT made them, but within tolerance. As long as you understand, the lower Gm is by construction, and not because of lower emission, all is ok. The difference is small. 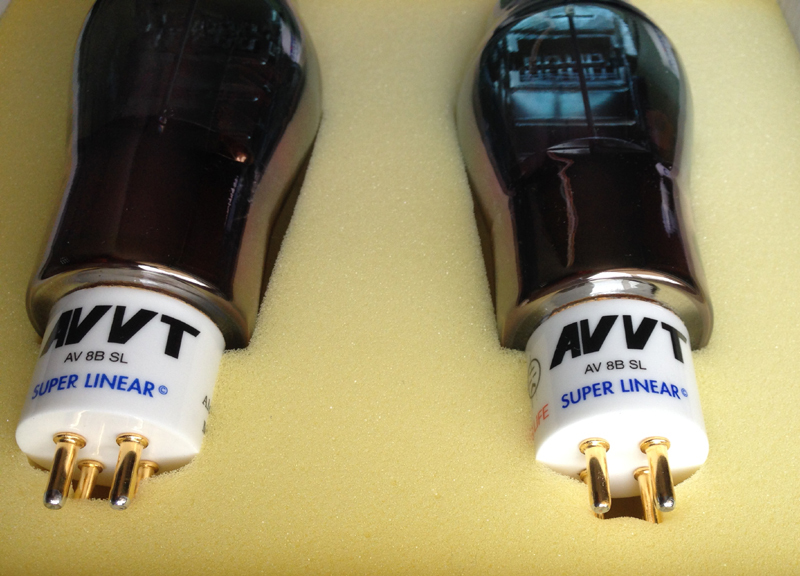 Tube hum: Will be significantly lower as with AVVT, due to better quality control. Glass shape: For 32B we use similar glass shape as AVVT. 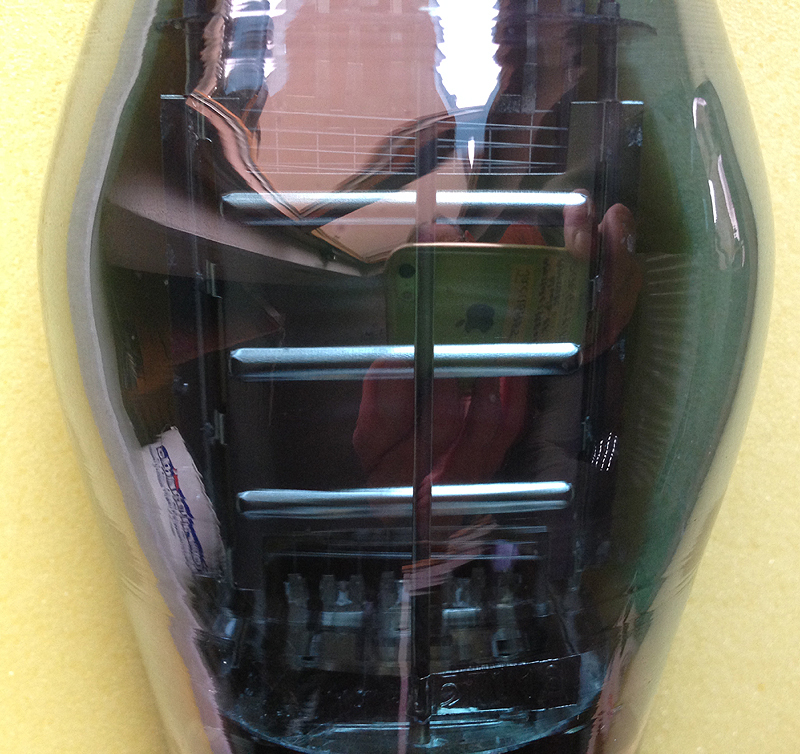 The 300B is overhauled, using the same glass shape as EML 300B. 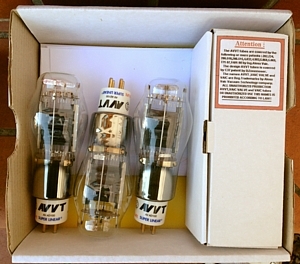 Lifetime: Lifetime of these tubes will be a higher as when made by AVVT. Guarantee: Three months on all manufacturing failures. Mechanical strength: We replace the (very soft) side bars of AVVT by a hard metal, same as we use this at EML. So risk on postal damages becomes low. 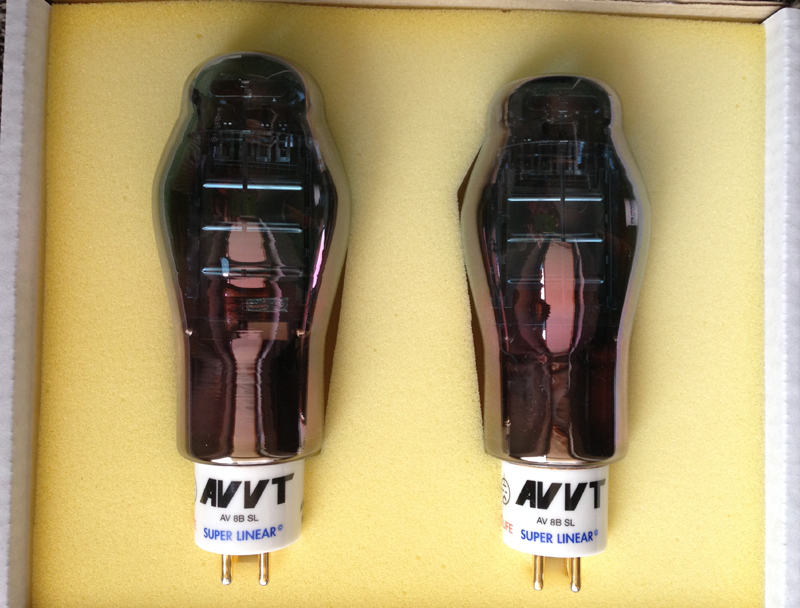 When you have a pair of defective AVVT tubes, you can send them in, and you receive the overhauled pair, ready from stock. The tubes you send in, should not have broken glass. 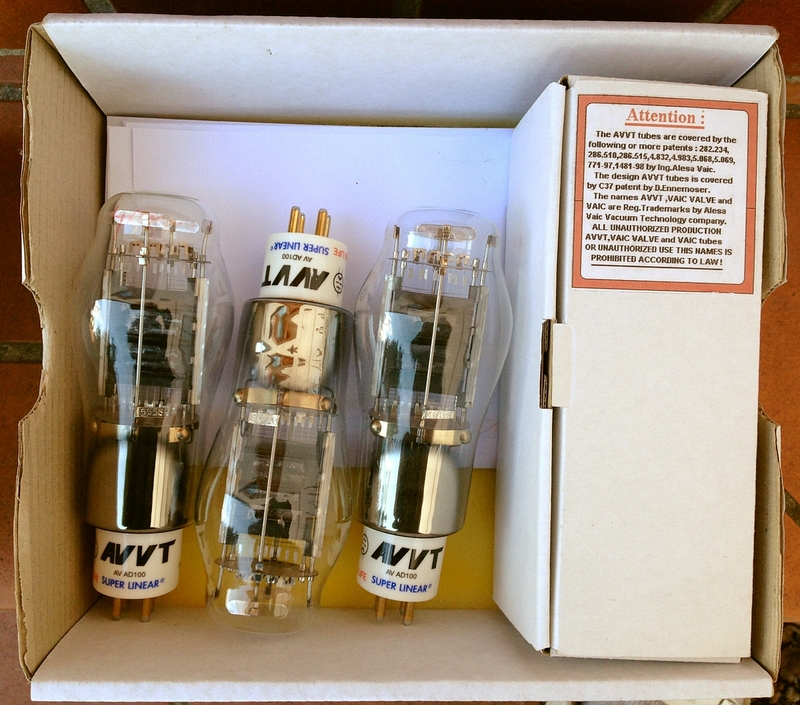 See jacmusic price list under AVVT Ship us your defective tubes. You receive an overhauled pair from stock. This is fully good, unbranded prototype, used for small tests only. Tube curves and full test data is with the tube. Heater is 5V / 1.55 Ampere. Sorry, need to add pictures . Please ask if needed. VAIC - VV300B-Globe - NOS. These are made appr. year 2000. There was an Ebay seller from USA seller asking 1500US$ on Ebay for a pair, but not selling them. 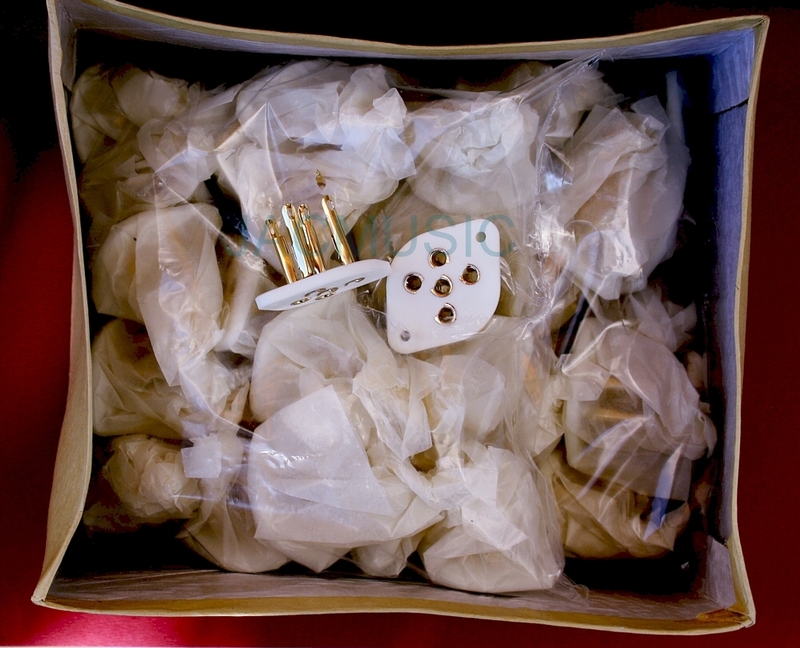 Packed in white box, or EML box, whatever preferred. With test data. 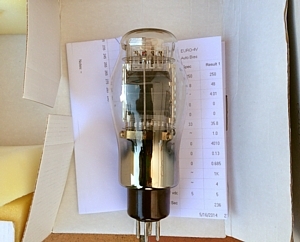 This is a SINGLE tube, year 2001 never used (NOS) 520B-V2 in mint condition. VAIC BRANDED. (So not Emission Labs). The heater is 6.5 Volt. This is a new and good tube. When you need to make a pair complete again, this is the tube you are looking for! Packed in a new Emission Labs box, test data is included. 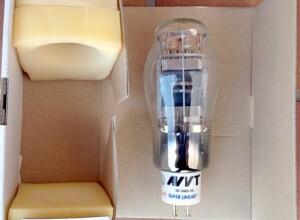 This is a very good condition, used tube from Dec 2002. It has has two bottom getters, vs one bottom getter and one top getter, of the later tubes. The tube replicates exactly the original test data of 2002, meaning there was little use. The original 2002 report is still with the tube, as well as a recent (March 2017) re-test report. We have this tube stored here unused, since 2007. Ideal to complete a pair, if you need only one tube. 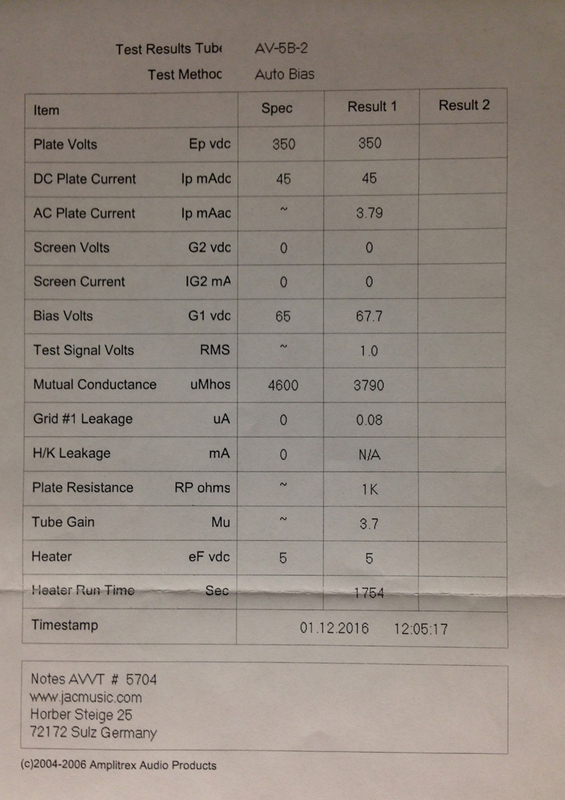 Full data test report included. This is a NOS tube from 2005. Ideal to complete a pair. 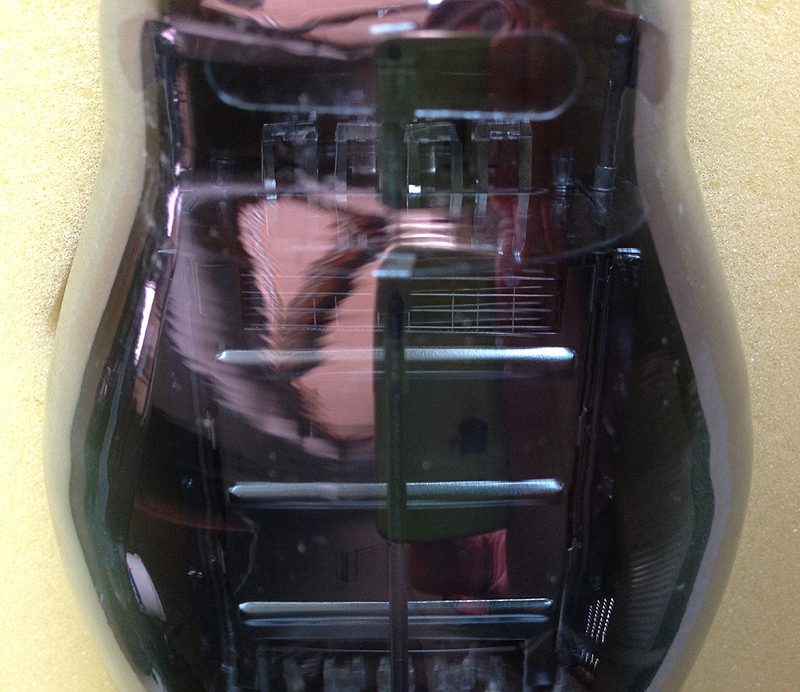 For the anode there has been a small and a large window. This is the version with the large window. 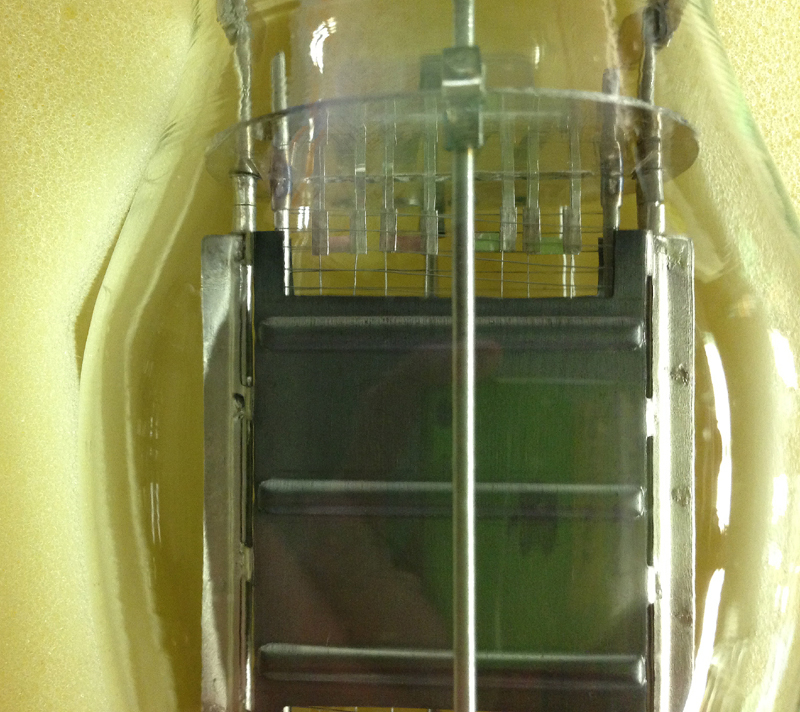 Please click on the left picture, to see the shape of the anode in detail. EML 50-Mesh / Gold Grid. These are two good pairs from running production, with a very minor cosmetic issue, you may not even notice. At the sides of the anodes are two little holes. These pairs have one tube with, and one tube without those holes. These are two perfectly, matched pairs for the rest of it, with full Guarantee, and 5 years registration program is possible. EML RGN2504 with UX4 Socket. 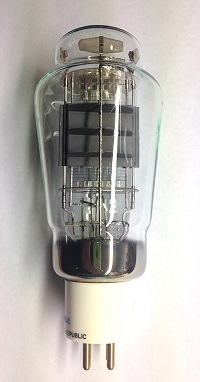 This is an experimental tube from 2005. This is a good working and fine condition tube. We just never build this tube in series. I really don't have the time to sell small packages on Ebay, but this is good material, to sell there when you have a shop. 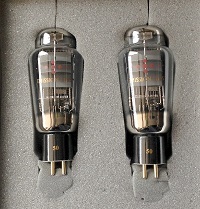 Tubes are individual boxed. Date Code 2006, when their quality was much better than today. Smaller quantity is possible. At this price. minimum 50pcs. 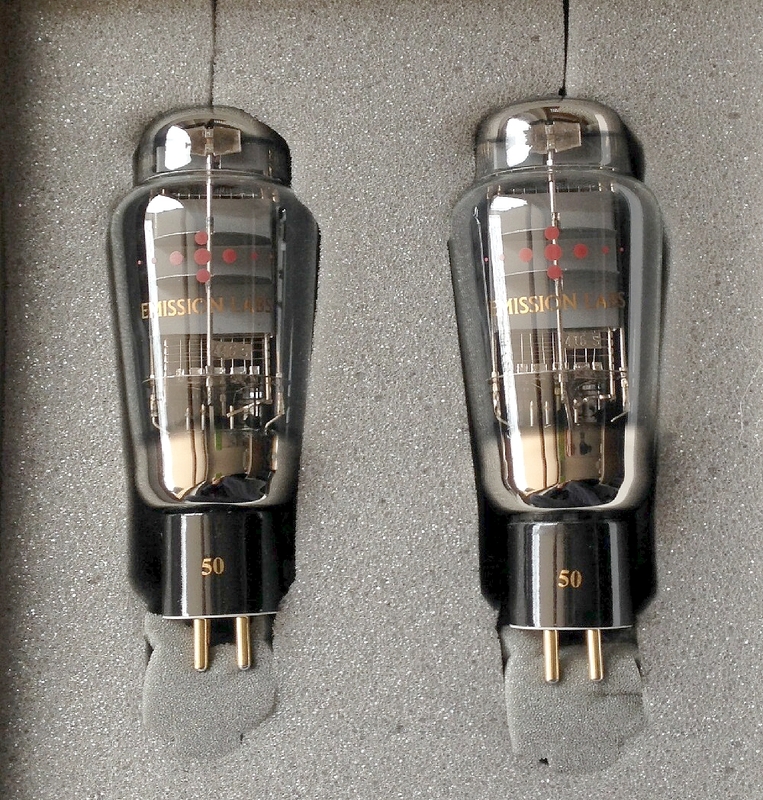 Tubes are individual boxed. Date Code 2006, when their quality was much better than today. Gold pins, and gold printing. At this price. minimum 50pcs. 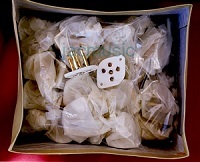 Original factory 100pcs bulk pack. Some are still sealed. 6922 (E88CC) Philips ECG USA. Please check regular price list. Original, sealed 100 pcs boxes, inside are individual boxed tubes, with blue or green printing. Made in USA. At this price. minimum 50pcs. Looking for 6SN7 NOS? You can try with 7N7 instead! 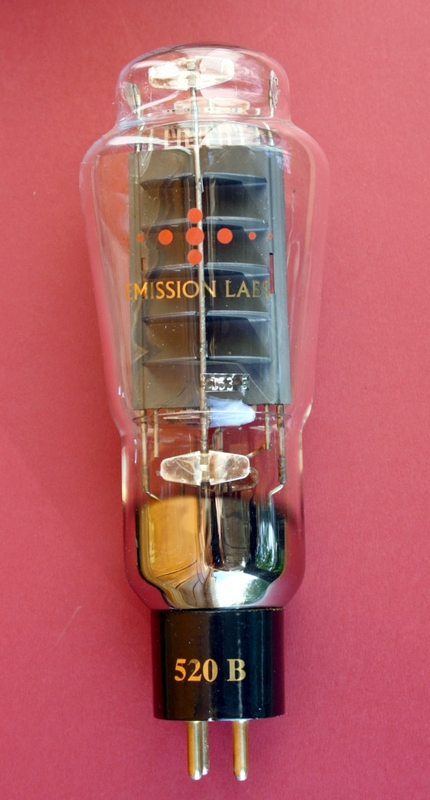 This tube is for sale in beautiful NOS quality. Only thing the socket is LOCTAL. 6SN7 and 7N7 are electrically INDENTICAL. Datasheets are electrically identical, and I see even the same piece parts in there. Loctal sockets look and cost the same as octal sockets. So think out of the box, and buy a five pack 7N7 fore what you pay for one 6SN7. The socket is almost wired the same. 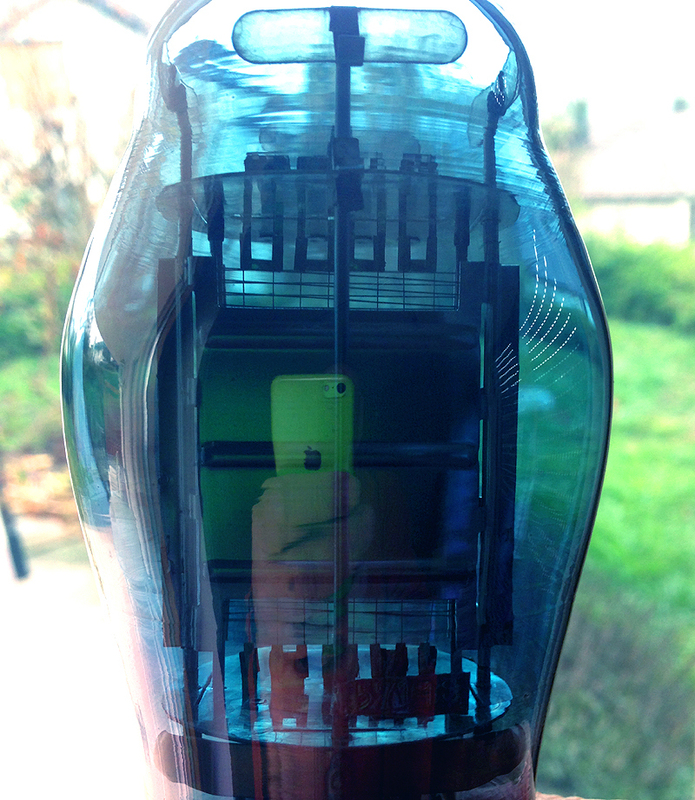 The tube is rotated inside the bulk for one pin position and two pins are exchanged. So not a big difference. 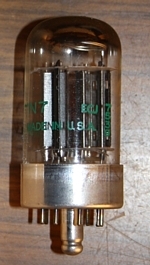 The amplifier chasses needs not be significantly changed when you modify your amp for 7N7. 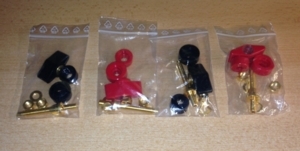 We have also Gold Pin socket adapters from 7N7 to 6SN7. I have seen them go on Ebay for 2x that price. Plate choke. New transformer, just non Standard DC current version. These are 208Henry, 12mA. 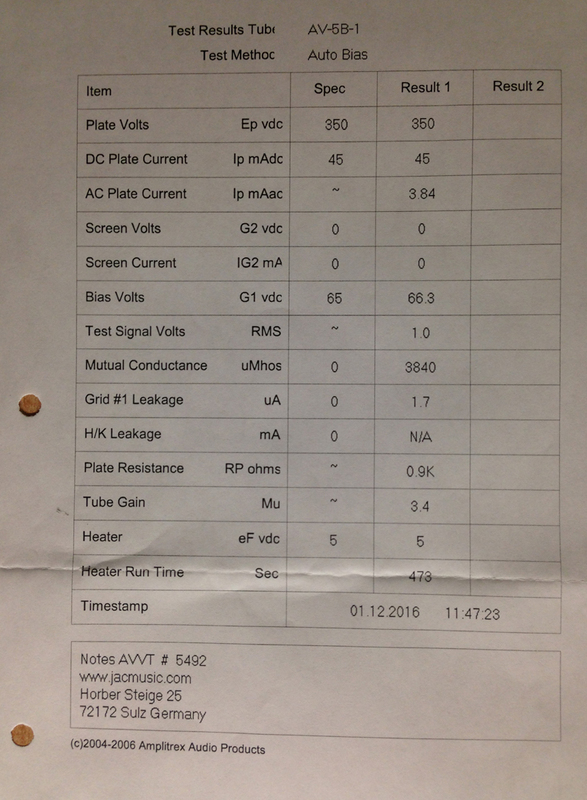 For the rest, the standard data sheet applies. 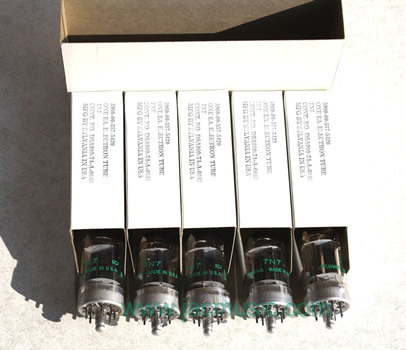 We offer sometimes tubes here that are new, but at reduced prices, or just used very little and in perfect condition as well. There is nothing wrong with those tubes whatsoever. Still, when we do have a guarentee case, we may not be able to replace them with similar ones. In such a case, you can use the amount of money you are entitled to, as a credit in our shop for any other new or used item of your choice.